Nice First Edition hardcover, pages are clean, crisp, binding tight. Cover boards fine in fine dust jacket. Signed by author on title page. A pristine copy inside and out. --A powerful, soaring novel about a stolen desk that contains the secrets, and becomes the obsession, of the lives it passes through. For twenty-five years, a solitary American novelist has been writing at the desk she inherited from a young poet who disappeared at the hands of Pinochet's secret police; one day a girl claiming to be his daughter arrives to take it away, sending her life reeling. Across the ocean in London, a man discovers a terrifying secret about his wife of almost fifty years. In Jerusalem, an antiques dealer is slowly reassembling his father's Budapest study, plundered by the Nazis in 1944. W W Norton & Co, 2010. First printing. Signed on title page. A series of interrelated stories connecting Pinochet's secret police, London suburbs and an antiques dealer in Jerusalem. Author has also written The History of Love and various short fiction. Unread, as new in like DJ. 289 pp.. Signed by Author. 1st Edition. Hardcover. Fine/Fine. NY: Norton. F/F. 2010. First Edition. Hardcover; First Printing. Signed by the author on the title page. National Book Award nominee for 2010. A new, unread copy. ; 2015; Signed by Author . New York City, NY: W. W. Norton & Company, 2010. First Edition. First Printing.. Hardcover. Fine/Fine Dust Jacket.. New York City, NY: W. W. Norton & Company, 2010. Hardcover. Fine/Fine. First Edition/First Printing. 290 pages. The author's third novel. One of the most important literary events of the decade. The First Hardcover Edition. Precedes and should not be confused with all other subsequent editions. Published in a small and limited first print run as a hardcover original only. The First Edition is now scarce. 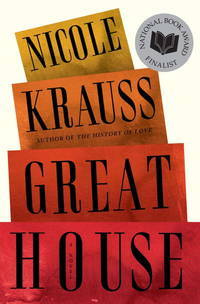 Presents Nicole Krauss' "Great House". Her third novel, and her first since the critically acclaimed "The History of Love" (2005) . The novel tells not one but several narratives that are unrelated to each other but are tied together by and revolve around a physical object, a writing desk. Krauss uses the desk as a metaphor for destruction, loss, and recovery through memory. With "Man Walks Into A Room" (2002) , Nicole Krauss "strides into the forefront of American letters" (Susan Sontag) . "Great House", a "soaring, powerful novel about memory struggling to create a meaningful permanence in the face of inevitable loss", confirms that she will stay there. An absolute "must-have" title for Nicole Krauss collectors. <b><i> This copy is very prominently and beautifully signed in black ink-pen on the title page by Nicole Krauss. It is signed directly on the page itself, not on a tipped-in page. This title is a contemporary classic. This is one of few such signed copies of the First Hardcover Edition/First Printing still available online and is in especially fine condition: Clean, crisp, and bright, a pristine beauty. Please note: Copies available online have serious flaws, are subsequent printings, or are remainder-marked. This is surely an accessible and lovely alternative. A scarce signed copy thus. </b></i> Nicole Krauss was selected as one of the "20 Writers Under 40" of the decade by The New Yorker Magazine. One of the most brilliant new voices in American literature. A fine copy. (SEE ALSO OTHER NICOLE KRAUSS TITLES IN OUR CATALOG). ISBN 0393079988. W. W. Norton & Company, 2010-10-12. First Edition. Hardcover. Fine/Fine. Signed. New York: Norton, 2010. Hardcover. First edition, first printing. Signed by Krauss on the title page. Story of lives intertwined by the presence of a desk. Finalist for the National Book Award Fine in like dust jacket. W. W. Norton & Company. Hardcover. 0393079988 Like New Condition. . Fine. New York: Norton. Fine in Fine dust jacket. 2010. First Edition. Hardcover. 9780393079982 . First impression. Signed by author on title page. ; 8vo - over 7¾" - 9¾" tall; Signed by Author . New York: W. W. Norton & Company. Fine in Fine dust jacket. 2010. First Edition; First Printing. Hardcover. 9780393079982 . Signed by Krauss on the title page. A novel where a huge old desk with many drawers becomes the symbol of love and loss for a host of characters from different countries and time periods. ; 289 pages; Signed by Author . Findaway World, 2010. PLAYAWAY. Reliable and Presentable PLAYAWAY EDITION. Withdrawn from the library collection. Digital audio player already pre-loaded audio book. PLAYAWAY IS EASY TO USE! Just plug in the earphones, press the power button ON and begin to listen and enjoy. This PLAYAWAY comes in the original orange sturdy plastic Playaway case with some library markings. Included is an earphone and new battery. So convenient. Light weight with a powerful purpose. Take along on your next journey! Makes a sensitive get well gift! Enjoy the convenience and versatility for all your travel and leisure needs.. preloaded_digital_audio_player. Good. Audio Book. W. W. Norton & Company. Hardcover. 0393079988 First edition, First Printing. Signed by the author on the title page. Not inscribed, price clipped or otherwise marked. Securely wrapped, dust jacket in protective cover and shipped in a box. Full # line starting with a 1. . Fine. NEW YORK: W. W. NORTON & CO. VG/VG PAGES CLEAN, BINDING TIGHT. Pages: 289. . 2010. 1ST PRINTING. HARDCOVER.. Condition: VG/VG PAGES CLEAN, BINDING TIGHT. Pages: 289. F/NF. DJ has light scoring on r ear Fir st U S Edition. First Printing. . Near Fine . Hardcover . 1st Edition . 2010 . New York, New York: Norton, 2010. First Edition. Hardcover. Fine / Fine. Signed by the author on the title page. Octavo, 9 1/2" tall, 289 pages, brown and beige boards. A fine, clean, neat hard cover first edition with light shelf wear; hinges and binding tight, paper white. In a fine, lightly edge worn dust jacket with the original price.